How was your weekend?! As I said on Friday, Eddie was off from Thursday to Sunday, which rarely ever happens (maybe 3 times out of the 12 years we've been together!) so I really soaked up every minute with him, Aviah, and my step-daughter Destiny. We moved to Connecticut a year ago, but so much has happened this past year (we moved, I got pregnant, Eddie switched jobs & I gave birth) so we didn't have much time to get familiar with our new home town, until this past weekend. It literally felt like a vacation because again, I'm so not used to him being off for so long and life was just going at a slower pace, especially since I ditched my phone (for the most part ;). During the summer weekends, many of us have fun plans that involve getting out and getting active, whether it be strolling around, brunching, or what have you, we just want to get up and out! This means we're cutting back the time we spend getting ready with quick and easy makeup routines and clothing that we can just throw on and go, but of course we don't want to sacrifice style, right? 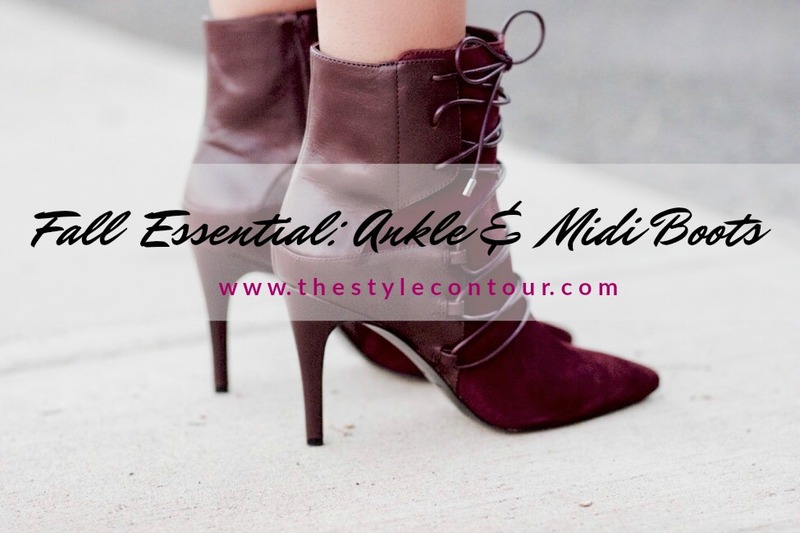 In case you missed it, last week, I began a series on the blog entitled Fall Essentials. 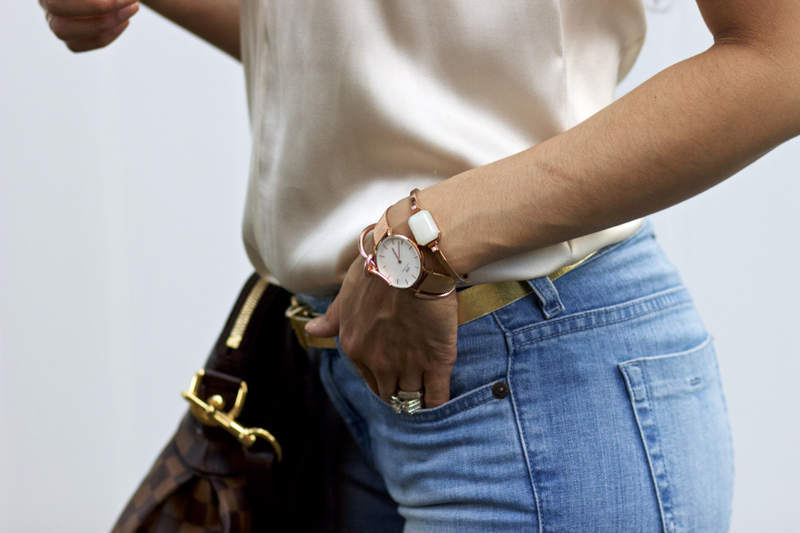 The series will feature some of my personal favorite essentials for the fall season and I'm sharing them all with you leading up to fall in hopes of inspiring you to add in some of the gaps you may have in your fall wardrobe or perhaps give you some ideas and inspiration for wearing and styling them. 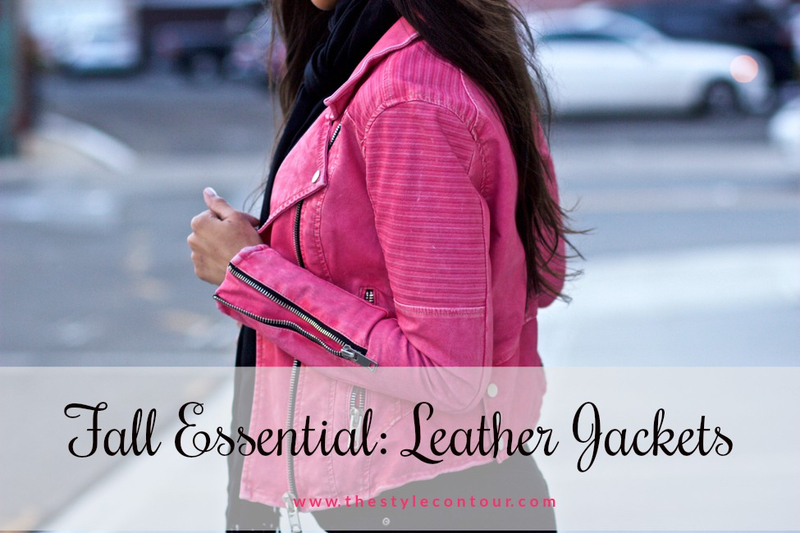 If you did miss that introductory post, you can check it out here, it was on my personal favorite fall staple, leather jackets! You all know how much I love pink, it's my favorite color, so I'm always looking for (unique) ways to wear it, aside form pairing it with neutrals. This year, Pantone declared "greenery" as the color of the year, which is a similar shade of green to the one I'm wearing in today's post. I've never combined green and pink quite like this before (I have color blocked with other shades of the two and with other colors included) so I figured I'd give it a try and I love the way it looks. I feel it's a combination that's relevant, since blush pink is trending so much and it's one that perfect for summer, since it's a bit playful and summery. Last weekend, I was sorting through my closet and came across these 7 for all mankind jeans I've had for quite some time now but rarely ever wear. When I took them out, I no longer felt they were my style and placed them in the pile of clothes to give away, until I a light bulb went off and I thought, "why not try to distress them and make them into a brand new pair?" I had never done this to a pair of jeans before and I'm not the best at DIY projects, so I was a little nervous about how they'd turn out. My posting schedule is a little all over the place this week, so sorry about that! It's been one of those weeks that something keeps popping up and not enough hours in the day, we all have them, right? I hope you all had a great weekend and are off to a wonderful start to your week so far! Spending money on a ton of luxurious, high-end pieces isn't always an option due to the hefty price tag, but that doesn't mean that we cannot dress in a way that looks expensive. There are certain fabrics, textures, and even colors that can make an item appear more expensive than it actually is, like satin. Satin has a very romantic, therefore luxurious look to it. Happy Wednesday my dear friends! Lately, I've been noticing more and more waist enhancing pieces trending a lot on social media and popping up in some of my favorite shops. Most pieces I've noticed have a corset design, such as a sweater or dress that has it built into them, paper bag waist trousers and shorts, or the corsets themselves. This is a trend that I feel most will love because it creates a nice flattering emphasis on the waistline, creating definition where there is none or enhancement where there is. Plus, they can work well into any personal style depending on the colors and overall styles you choose.